As a child in India, Cheetie could often be found in the kitchen with her mother and grandmother watching, and learning as they prepared daily meals. Her family held strongly to their culinary heritage, thoughtfully passing on generations old technique and authentic preparation. At the age of 8 her family settled in the Bronx, NY. Immersed in a world of various ethnicities, Cheetie was exposed to new cultures, flavors and food. Cheetie is a self-taught cook who studied recipes while pursuing a career as a guitarist in The Cherry Valence and more recently Birds of Avalon, alongside her husband and business partner, Paul Siler. Time on tour and as the owner of the music venue Kings and adjoining cocktail bar, Neptunes Parlour, taught her the value of the independent, artistic spirit that is the backbone of the downtown Raleigh community which she considers home. Upon moving to North Carolina, she embraced the area's culture of readily available renowned agriculture, and incorporated these seasonally evolving foods to fit her multi-cultural menus at Garland. Cheetie’s cooking is created in a refined and thoughtful way, filled with imagination and rebellion. It is unassumingly delicious. 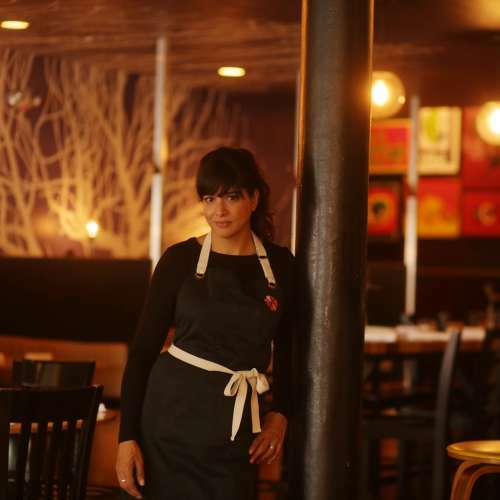 Her food may seem “foreign” but is rather an interpretation of local ingredients made through the eyes of someone who grew up in India, New York City and the South. She was profiled in the New York Times in October, 2018 was nominated semifinalist for James Beard Award’s “Best Chef: Southeast” in 2017, 2018 and 2019.